St. Cronan's SNS have been involved in many musical activities over the last decade. These activities included annual participation in the Hallelujiah Choir, Christmas Concerts, Ceili dancing and Talent Shows. In addition, the school has also presented the childrens' opera 'The Torc of Gold' as part of an integrated arts project with the National Chamber Choir and the unforgettable musical 'Oliver' to great acclaim. Bíonn a lán rudaí ar súil í Scoil Chrónáin í rith Seachtain na Gaeilge. Bíonn gach duine ag déanamh iarracht Gaeilge a labhairt i rith an lae. "Dia duit", nó "slán go foil" nó "an bhfuil cead agam". Gach bhliain, bíonn ceilí mór againn sa halla. Bímid ag déanamh an damhsa "Ballaí Luimhní" (Walls of Limerick), "Ionsaí na hInse" (Siege of Ennis), an Damhsa Mór agus Shoe the Donkey. Bíonn an-craic agus spoirt againn! At St. Cronan's we have a dedicated team for the promotion and development of G.A.A games in the school. We have hurling and football teams for both boys and girls at Junior and Senior Level. The teams train after school throughout the year from Monday to Thursday and we enter the Cumann na mBunscoil league and the Fingal League before and after Christmas. 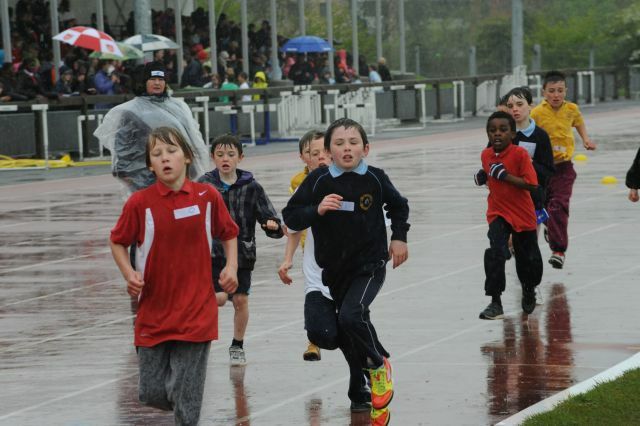 Santry sports is an atheltic competition. It is held in June each year in Santry Stadium. We offer a cycling programme to 4th classes each year. This is a 6 week programme organised by the Road Safety Authority where the children are taught cycling skills, basic bicycle maintenance, importance of safety equipment etc. We have bike stands in school to which the children may lock their bikes. Swimming lessons are offered to 3rd and 4th classes in St. Cronan's during the school year. An eight week coaching programme by professional swimming coaches takes place in ALSAA swimming pool at Dublin Airport and has proved extremely popular with the children. Apart from the fun element, being able to swim is a life-skill which can open up opportunities later in life to experience many different watersports. Every year, during Advent, the children are encouraged to collect copper coins which are then donated to St. Vincent de Paul to help people in our own local community. Swords Credit Union operates a savings scheme through the school. The scheme is open to all children in the school. The main aim of the scheme is to encourage the children to adopt a regular savings habit and thereby to sow the seeds of good financial management for the future. The Credit Union calls to the school every Thursday to collect savings from the children. Children can save a minimum of €1 per week upwards. The Credit Union School Quiz is an annual event for St. Cronan's SNS. The quiz is a fantastic opportunity to encourage learning and teamwork among our pupils. We enter the U-11 and U-13 categories and have experienced tremendous success at a local level and there are many trophies on display in the school. The quiz is a great day out for the children, their families and friends. We have an excellent school library with a wide variety of books. Each class visits the library on a weekly basis.